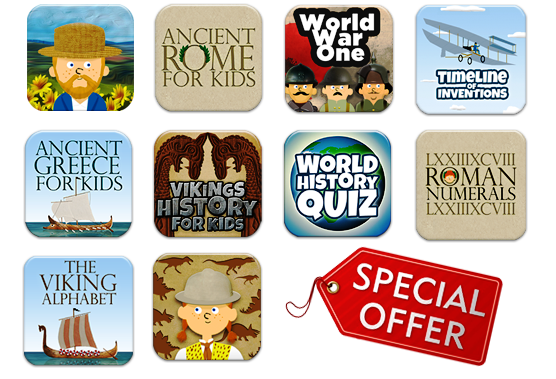 History apps for students, schools, parents and teachers! History apps for students, parents and teachers! Explore History! Engage with interactive stories, timelines, games and resources to learn about the wonders of the past. Are you a teacher using iPads / Android devices in the classroom? Email us to try our apps completely FREE! HistoryApps is a publisher specialising in mobile learning for education and training. We focus on creating digital content and curriculum resources for schools and colleges. We think playing and having fun is a great way to learn about the past. Did you know? Schools can receive a 50% discount on Apple’s App Store when purchasing in quantities of 20 or more (VPP). 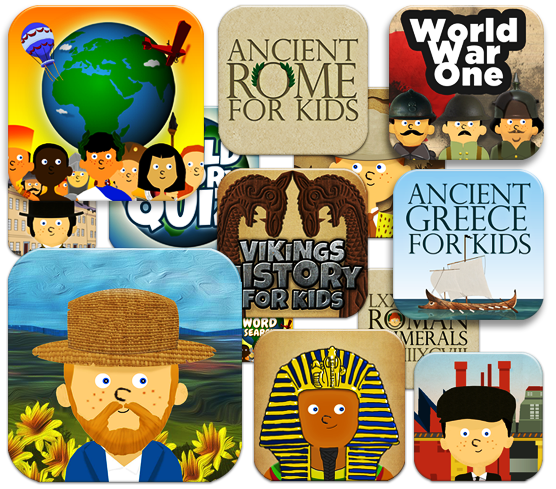 Discover our resources of curriculum-based history games for primary / elementary students and learn all about the ancient Greeks, The Romans, The Vikings, The Egyptians, The Victorians and much more! The Volume Purchase Programme allows educational institutions to purchase apps in volume and distribute them to students and teachers. Purchase in bulk and get 50% off for purchases of 20 apps or more.